The boot camp will be held at the University of Notre Dame in South Bend, Indiana. The science classroom building, (Jordan Hall of Science - Room 101) will be the location of most of the sessions. The campus motel (The Morris Inn) will be the location of the keynote lecture and banquet dinner. Keough Hall dormitory will be used for lodging (see "Lodging" for more). Please note that Notre Dame is in the Eastern Time Zone. South Bend has an airport with direct flights from Chicago, Detroit, Minneapolis, and other cities outside the region. There is also a commuter rail service connecting the South Bend airport with downtown Chicago. Notre Dame is conveniently located off the Indiana Toll Road (I-80/I-90) and South Bend is also served by US-31 for those coming from the south or north. The South Shore Line (http://www.nictd.com/) trains make 5 daily trips between the Chicago Loop (corner of Michigan and Randolph) to the South Bend Airport. This 2.5 hours has a one-way fare of $13. Chicago’s O’Hare Airport is about 2 to 3 hours by car. Chicago’s Midway Airport is 1.5 to 2 hours by car. CoachUSA (http://www.coachusa.com/) shuttle buses makes nine daily trips between campus and both Chicago airports. This 3 hour trip has a round trip fare of $75. The prices listed are approximate and for informational purposes only. Prices subject to change. Attendees will stay on Notre Dame's campus in Keough Hall dormitory in air conditioned, single occupancy rooms with shared bathrooms. Each room will come with a pre-made bed and towels. No alarm clocks, TVs or telephones will be provided. Boot Camp guests will be able to use Notre Dame's guest network (ND-guest) - no password is required. If you need assistance connecting to the ND-guest network, please contact the OIT Help Desk at (574) 631-8111. Notre Dame has 2 visitor parking options, hereby referred to as the Dorr lot & the Bulla lot. Please see the Map tab for the exact locations of each lot. Both lot options are free with conference registration and are available for all attendees. The Bulla lot features shuttle bus service that can take you to the edge of the walking-only part of campus; shuttles leave Bulla lot roughly every 15 minutes from 7 am to 7 pm, making stops on the east and north side of campus. The Dorr lot does NOT have shuttle service. Neither lot is labeled as a visitor lot. If the entrance lacks an access gate then parking is permitted. Please contact the planning committee If you have any questions. Park in the Bulla Lot on the east side of the campus. If you want a 6 minute walk to Jordan Hall, then park on the south side of the lot. If you want to take the shuttle to the Hesburgh Library, then walk about 3 minutes to Jordan, then park on the north side of the lot. Park in the Dorr lot (Lot D6) on the west side of the campus. 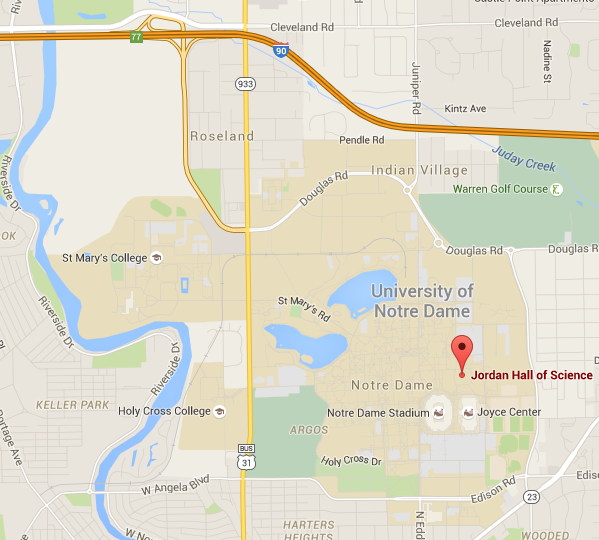 Ask Google Maps to direct you to Dorr Rd, Notre Dame, IN 46556. To get to the sessions in Jordan Hall, walk about 18 minutes. To get to the dorm, walk about 10 minutes to Keough Hall.